Indonesia, the archipelago of assortment, consists of thousands of islands; each with their own melting pot of characteristics. From religion to language, fauna to biomes, this Republic has such diverse ingredients that, to explore it, you really will feel like a kid in a candy store. For wildlife, the champagne truffles of this chocolate box are the islands of Borneo and Komodo. The sweet orangutans and the sour Komodo dragons are perhaps the most desired treats but, if you’ve got an adventurous appetite, it’s worth digger deeper in the jar..
Borneo is the largest island in Asia and is divided among three countries; Malaysia, Brunei and Indonesia. Arriving in Indonesian Borneo feels far more like landing on a tropical island compared to the futuristic airports of Malaysian Borneo. 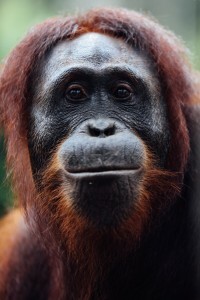 Although the whole island has suffered from severe forest degradation due to the palm oil industry, Tanjung Puting National Park in Central Kalimantan is a stunning UNESCO Biosphere Reserve that is famous for its orangutan conservation. A three-day river cruise from Kumai on a traditional Klotok boat takes you deep into this forest for a wildlife tour that’ll see you nose to nose with wild proboscis monkeys, giggling at guileful gibbons and enchanted by the ‘People of the Forest’ – our close cousins – the orangutans. Travelling by boat is a truly tranquil experience and means that the day hikes into the forest (when it’s incredibly hot) aren’t too long or strenuous. At night, you’ll moor up along the river and sleep under the stars with the firefly fiesta for your entertainment. Camp Leakey is an active research facility that you’ll visit on this tour. It was established in 1971 by a personal hero of mine, Dr. Biruté Mary Galdikas, who has worked tirelessly to protect wild orangutans and their rainforest habitat, as well as to rehabilitate ex-captive orphan orangutans for life in the wild. Everyday, the staff at Camp Leakey feed the rehabilitated apes and ecotourists are able to watch their behaviour at an incredibly close range. Sometimes the individuals stroll right up to the visitors (a mother and baby stopped mere inches from me), but however tempting it might be, the orangutans must never be touched in case of spreading disease. 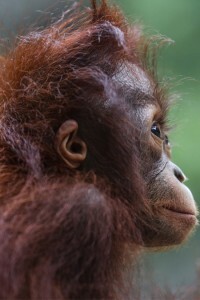 By visiting Camp Leakey, you’ll be directly benefitting the work of the Orangutan Foundation International and by visiting Borneo as an ecotourist, you’ll be helping to make the land more valuable as forest than as palm oil plantation. For a polar opposite wildlife experience to the cute fluffy mammals on Borneo, the deadly, man-eating dragons of Komodo are not to be missed. You’ll fly into Labuan Bajo on Flores Island – gateway to the Komodo National Park – and jump aboard another house-boat for a three-day ocean adventure. As you set sail on the glassy water to Komodo Island (and Rinca island where dragons can also be found) you’ll pass many conical green peaks of the neighbouring tropical islands. 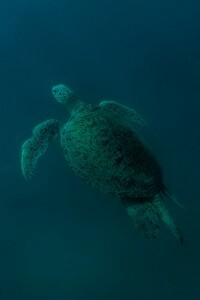 Here, you can snorkel and dive in technicoloured coral reefs with green turtles, lionfish, reef sharks and manta rays. 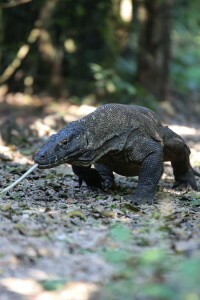 As cold-blooded creatures, the Komodo Dragons are more active at certain times of the day. A good time to visit Rinca or Komodo is first thing in the morning when the dragons are warming their scales in the early sun. They’ll be out in the open at this time and fairly still for photographs. A sighting of a dragon isn’t guaranteed as these animals are completely wild. However, if you’re lucky, an encounter with the largest living lizard on earth will certainly get your heart racing. At 10 feet long, these giant reptiles, with their loose leathery skin and mouths dripping with toxic, bacteria-filled salvia, are an intimidating sight. Even the guides are cautious leading you around the forest as one was recently killed from a deadly bite. As cannibals, it seems there is no large prey item that is off limits to the dragons and some ecotourists are lucky enough (or unlucky enough depending on your point of view) to see them feed. Their method of hunting is incredibly cruel. They’ll bite a deer or water buffalo (often on the hind legs) then run away. From then, that deadly saliva will infect the prey and make them weak. The dragon will follow the unfortunate animal until it’s too sick to fight back and then feast on its flesh – often whilst it’s still alive! You couldn’t get a more different wildlife experience than watching baby orangutans in Borneo, yet, seeing the largest venomous creature on our planet in action reminds us of the fabulous diversity that has evolved on our planet.